Following the advice I got from the user Semaphore I would like to split my original airport security question into separate parts and go into a bit more detail in regards to what I would like to know about those pictures, and this one in particular. 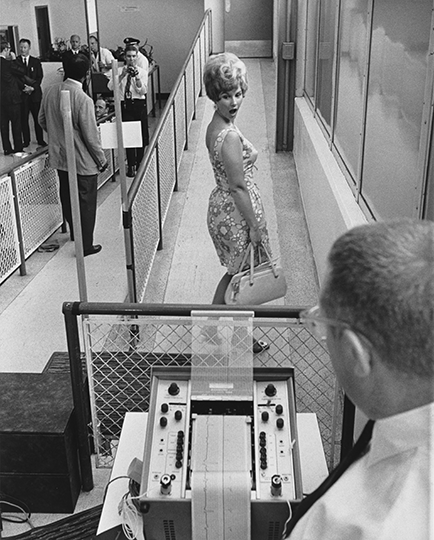 Just hate going through airport security with all those new gizmos, c. 1960. Taken at Atlanta Municipal Airport during testing for their first security instruments. That was before the first hijacking of a commercial flight in the US, if I am not mistaken! The picture is circulated in the web with this description, but I could not find any more information on it. And that just makes me even more interested to know what is actually happening there. Magnetometer technology certainly existed back then and could easily have been packaged in two poles like that. I'd guess that they were a fairly low-frequency resonant circuit where the field sort of just sits there between the two antennae humming quietly and happily as long as there's no metal in the middle. If metal comes through, the resonance is disrupted and the current changes. The strip-chart recorder would be displaying the current and would show a blip characteristic of the amount and type of metal and the speed of movement. I can't say for sure that that's what it is, but it certainly could be. There would be years of testing before anything went into production and use. OTOH, I agree that the picture looks staged. Where were visa documents invented?